The letter, which contained a white powder, is being examined by police. The FBI's Joint Terrorism Task Force in New York is leading the investigation into a letter containing a suspicious white powder that was sent to one of Donald Trump's sons. The task force has also teamed up with the Secret Service, the Postal Inspector and the NYPD. A preliminary field test of the powder sent to Eric Trump's New York City apartment Thursday indicated the substance did not appear hazardous, according to the source who was briefed on the matter. The NYPD said, "At approximately 7:15 p.m., the NYPD responded to a residential building at 100 Central Park South to investigate a report of a suspicious letter received by a tenant. The letter has been removed and is being examined by law enforcement authorities. No injuries have been reported in connection with this incident." The letter carried a Boston postmark. 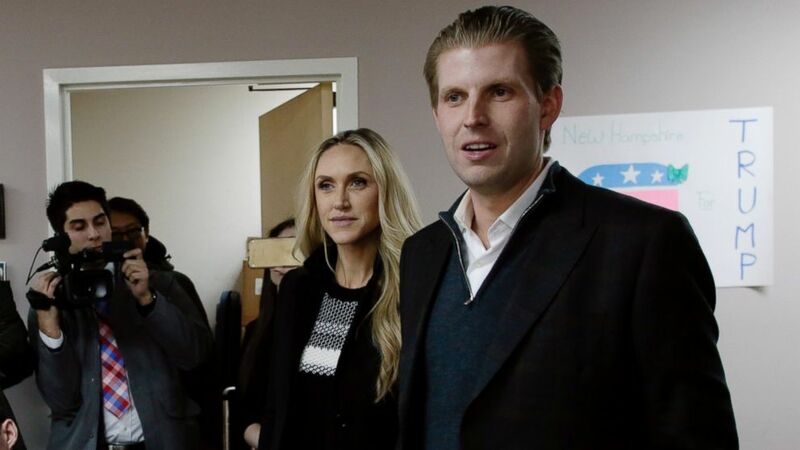 When Lara Trump, Eric's wife, opened the letter in their kitchen, white powder fell out, according to the source briefed on the matter. The handwritten note said: "If your father does not drop out of the race, the next envelope won't be a fake." It was signed "X." A source briefed on the investigation told ABC News that U.S. Secret Service protection only extends to Donald Trump at the moment. There were briefings given to the entire Trump family which included a review of how to properly handle mail, according to the source. ( Matthew Cavanaugh/Getty Images) Eric Trump, right, son of Republican presidential candidate Donald Trump, along with wife Lara, thank volunteers as they make phone calls to New Hampshire voters at Trump's campaign office, Feb. 9, 2016 in Manchester, N.H.
Protocol demands that Trump security personnel call local police, which in this case was the NYPD, with any emergency. In this particular situation, the NYPD immediately notified U.S. Secret Service and both groups are still investigating the letter. Out of an abundance of caution, the NYPD checked other known Trump locations, including Trump Tower on Fifth Avenue. John Cohen, a former acting Homeland Security undersecretary and current ABC News consultant, said the visibility of the New York businessman’s children on the campaign trail likely turned them into targets. "The Trump campaign has been very visible, has been described by a number of people as being divisive, and just as we have seen strong actions by his supporters, law enforcement would expect strong reactions from his detractors," Cohen said. "Unfortunately, in the time we're living in, that could also mean the potential for acts of violence against the candidate and those associated with the candidate,” he said. Cohen does not believe there is a direct link between the letter and the hacking of some of Trump's files by the hacktivist group Anonymous, noting that the sender and the group may have similar motivations but it's "unlikely that they worked together." The Secret Service confirmed that they are investigating the postings made by the hacktivist group. "The U.S. Secret Service is aware of the internet postings of Candidate Donald Trump’s personal information. We are working with the Federal Bureau of Investigation in this matter," a Secret Service spokesperson told ABC News.